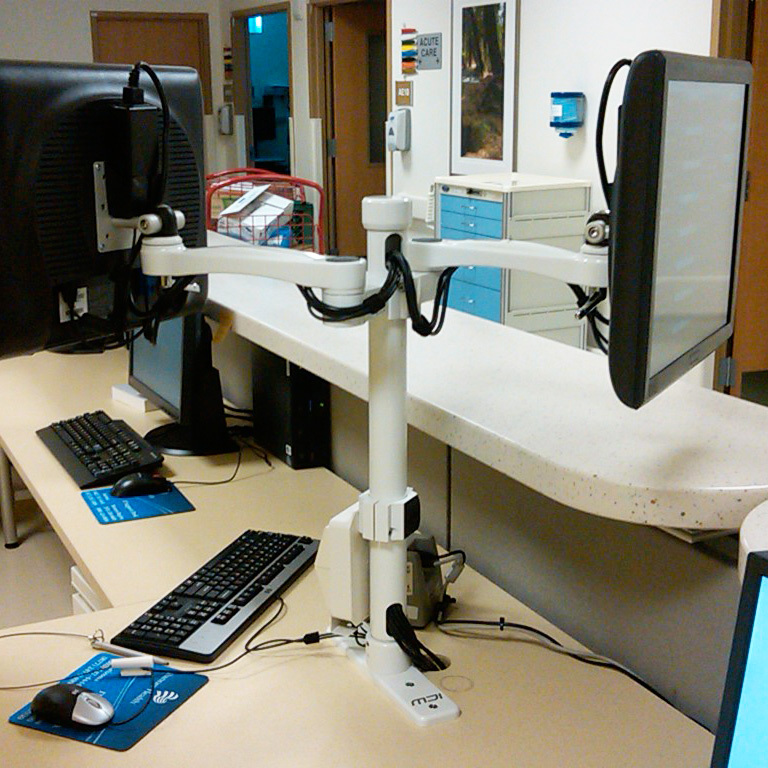 When you have a specialized device mounting challenge, ICW will work with you to create a custom solution that’s effective and easy to use. Our in-house design, engineering and manufacturing make it possible to produce custom and OEM mounts for any device. 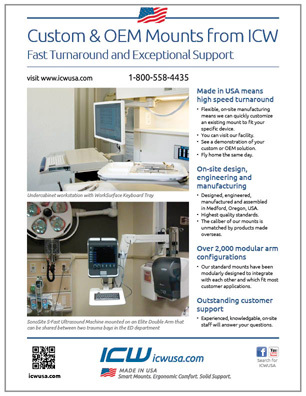 ICW custom and OEM mounting solutions are manufactured in our Medford, Oregon, USA facility to the highest quality standards. Visit our facility, see a demonstration of your mount and fly home the same day. The caliber of our mounts is unmatched by products made overseas. 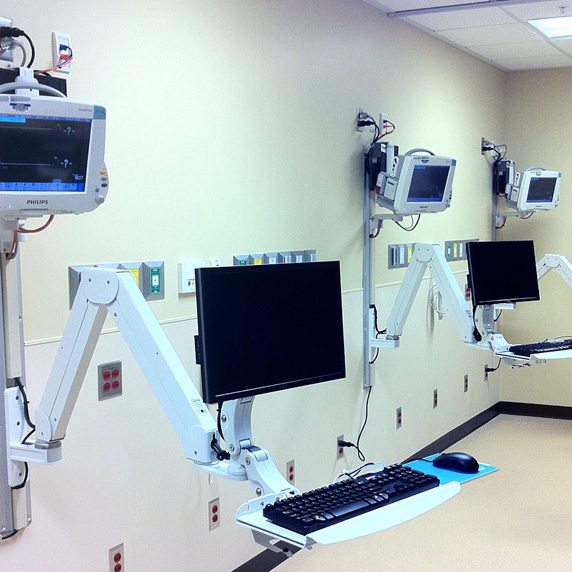 ICW’s on-site engineers work with you to define, create and test your mounting solution. 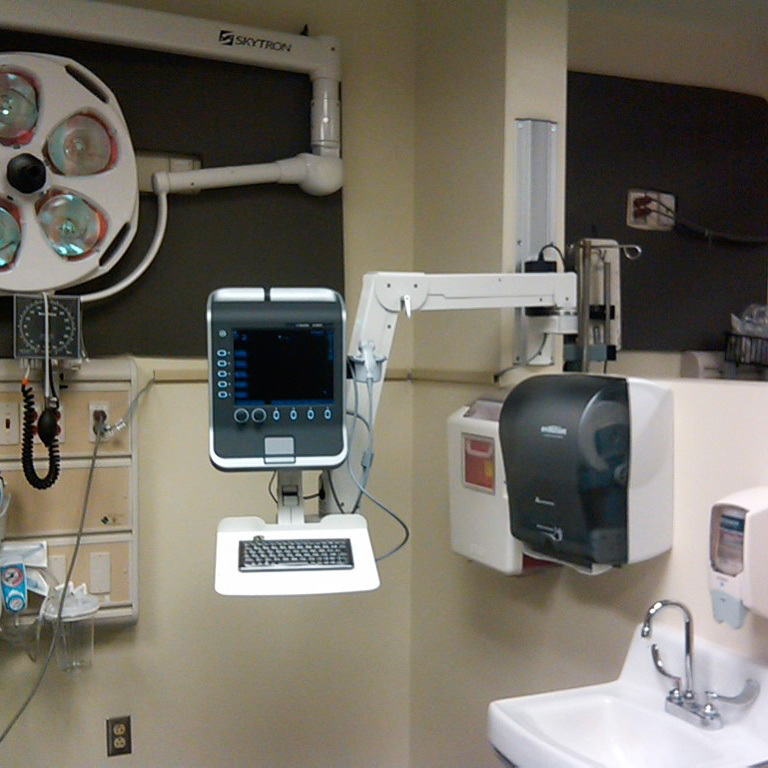 Our mounts are used extensively in healthcare, dental and institutional environments across the USA, Canada, Australia and Europe. All ICW mounts are finished with durable powder coating that is easy to clean and resistant to chemicals. ICWUSA.COM, Inc has over 2,000 modular arm designs that can be adapted to your needs. We can design and manufacture custom brackets and attachments to fit your specific device. We can engineer a fully custom mount to meet your unique challenge. Our customer service representatives have extensive knowledge of our product line and are available to answer your questions and provide total product support. 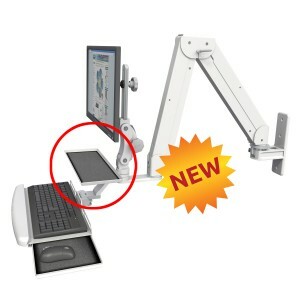 The Ultra 180 arm enables a laptop or computer to be positioned exactly where needed for greatest comfort and efficiency. Inverted Ultra 180 Arm. 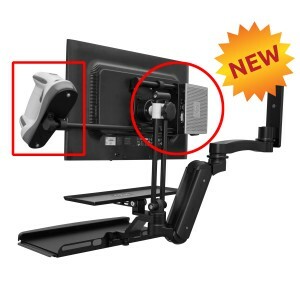 Mini PC Mount frees up desk space, mounts behind the monitor. 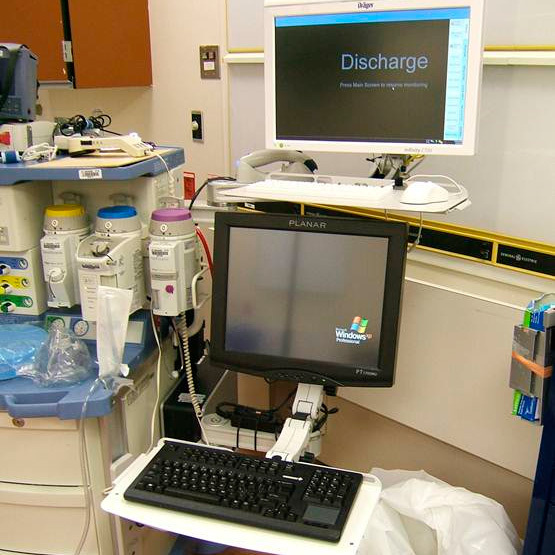 SonoSite S-Fast Ultrasound machine with laptop tray and mini keyboard on an Elite Double Arm that can be shared between two trauma bays in the Emergency Department. 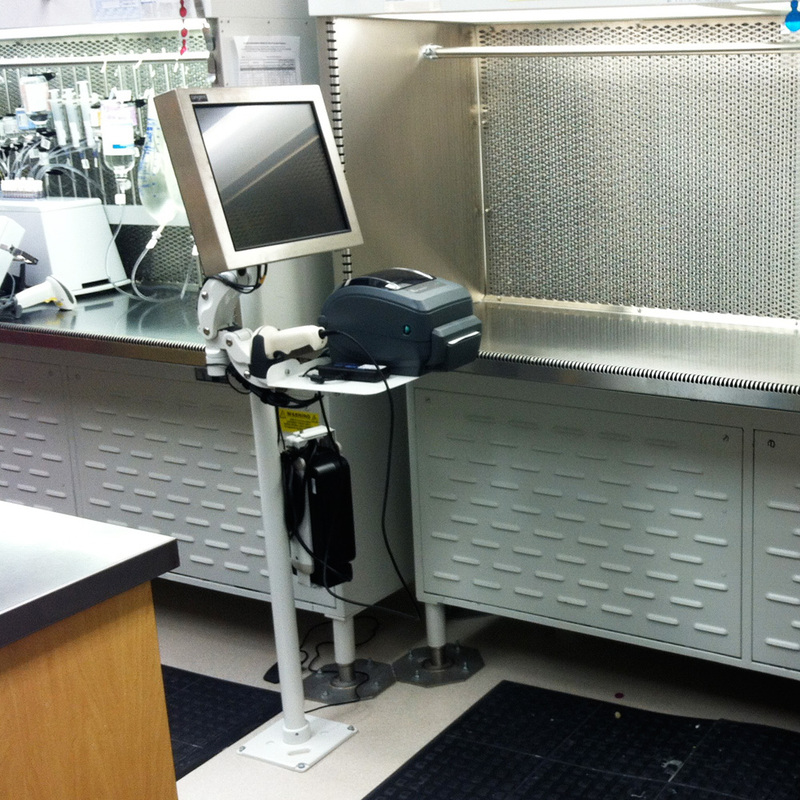 Ultra Pole Mount configuration for Baxter DoseEdge Medication Delivery systems in pharmacy clean rooms. 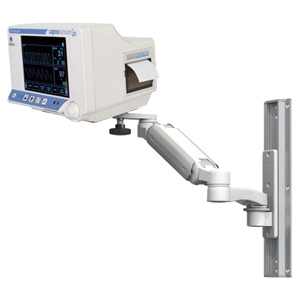 The mount holds a touchscreen monitor with scanner and Zebra printer. 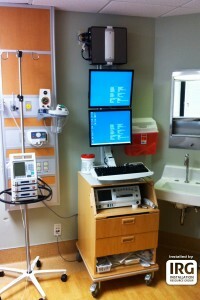 Two monitors are supported by a pair of Ultra Arms on a pole mount-desk mount hybrid. This configuration creates two workstations in a small area while providing proper ergonomics. wall track mounts with Phillips monitors and CPUs. 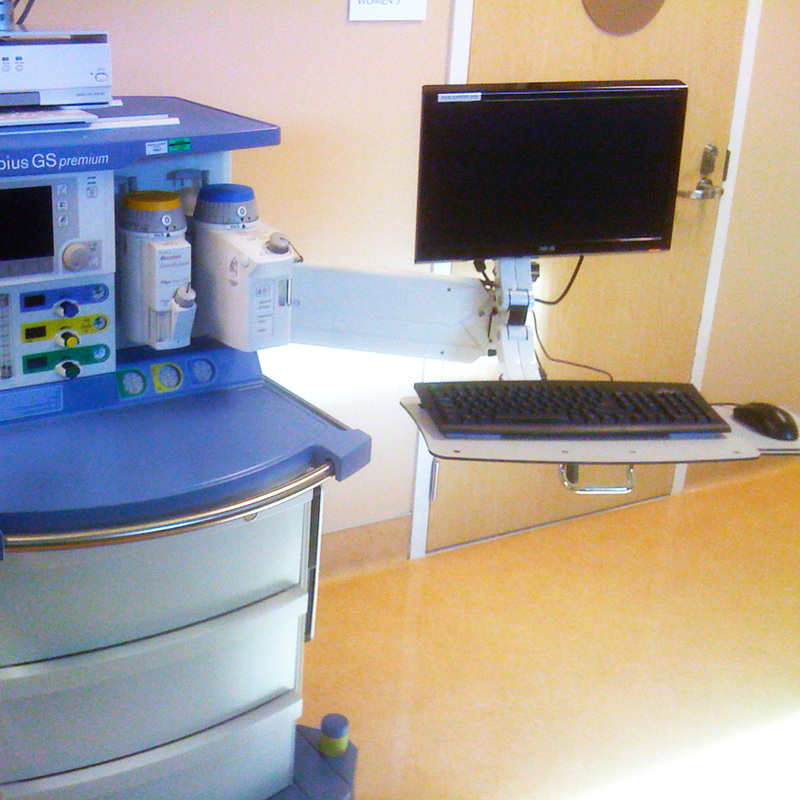 A Draeger anesthesia cart was configured with a convenient MD arm with Paralink adjustors supporting a monitor and poly keyboard. 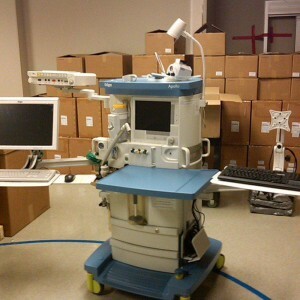 This workstation stows compactly when not in use. Dual monitor workstation and CPU are mounted to a wall track. The lower configuration includes a Titan Arm and keyboard tray with Paralink adjustor The fetal monitor station rolls under the workstation. 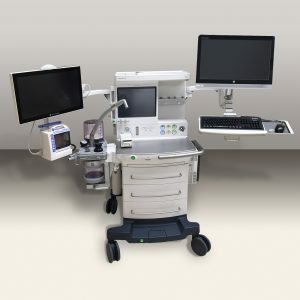 Mounting multiple monitors, keyboards and medical devices on an anesthesiology cart, durable Titan Arms provide convenience, rigid strength and space-saving stowability. 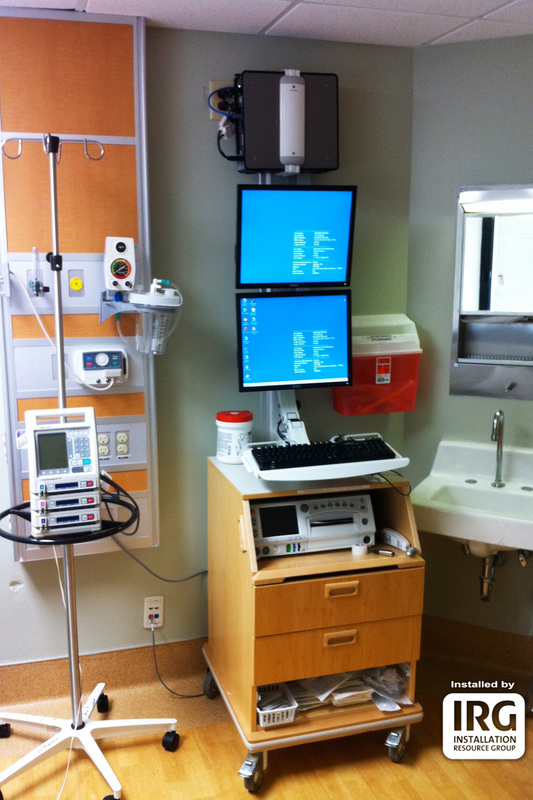 Capnography (carbon dioxide) monitors are required in all medical offices that perform medium or deep sedation surgery. 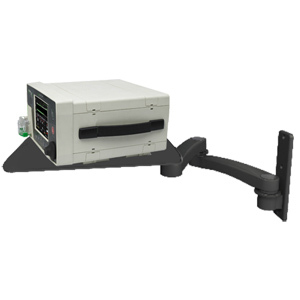 ICW Healthcare offers the Ultra 180 Arm for capnography monitors, enhancing convenience, safety and stowability. 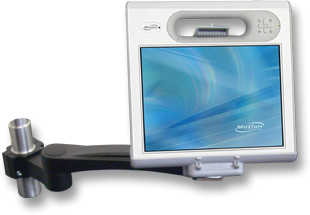 The Motion Tablet bracket allows the Motion Tablet to be mounted to any of our arms that have a VESA mounting interface. Enjoy the wide range of adjustment that ICW arms give you with your Motion Tablet. 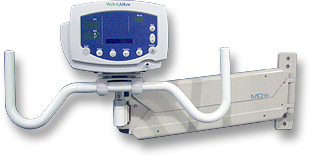 Signs Monitor bracket allows you to connect the Welch Allyn Vital Signs Monitor to the Ultra arm or the MD arms. A ball joint gives you 50° of tilt that is independent from the arm movement.